Price $750/MT CFR Karachi-Packistan, Mundra-India, Felixstowe-UK , Colombo - SriLanka also Indonesia and Malaisya , Ashdod-Israel, Aqaba-Jordan. For 25 kg bags : 23,000 MT / 920 bags per container 40ft. 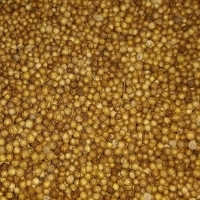 We are a company from Romania established in 1995 and dealing with coriander whole and split. We have our coriander factory .